This spooky book by Kate Coombs has 17 poems. It is creepy from beginning to end. The art is dark with lots of black, brown, olive green, orange, and pops of red and white. The words are often in white on a dark background. The cover is inviting for an older child, not a preschooler. It feeds right into the national obsession with zombies. There are no small children dressed in cheerful costumes in this book. The poems are about gargoyles, ghosts, mummies, wizards, Medusa with her snake hair, banshees, a werewolf, monsters playing baseball in graveyards, eating in the cafeteria, doing (or not) homework, and one chupacabra for a class pet. The poems rhyme except for three of them. “Monster Mash” is about being multicultural. The other ones that stand out are “Homework” (great ending) and “Hair Care” (all the snakes on her head). The others run together with their gore. Not all seven year olds will be able to handle the blood and guts of this book, but it will find its audience. This is not a bedtime story for children in an already scary world. This is a read it in the middle of the daytime book. The book gets an A for colorful while also gory, funny while also scary. Some children will shy away from the idea of death and the walking dead. The content skews older and might appeal better to tweeners (eleven and twelve). Teachers could use the book in October for a poetry unit or other writing exercise. Art teachers could use it to introduce drawing monsters. It’s a clever idea for the zombie lovers and those that like to pretend and even become a little bit scared. 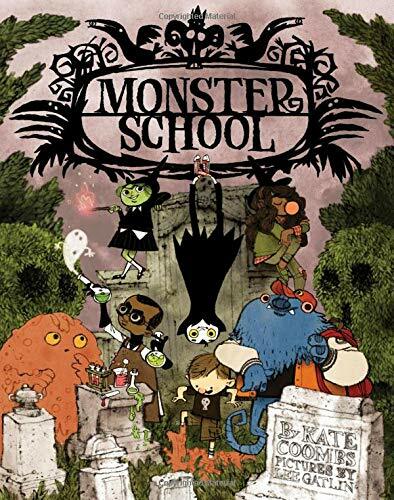 Monster School will creep its way into libraries across the country, except for the parochial ones.